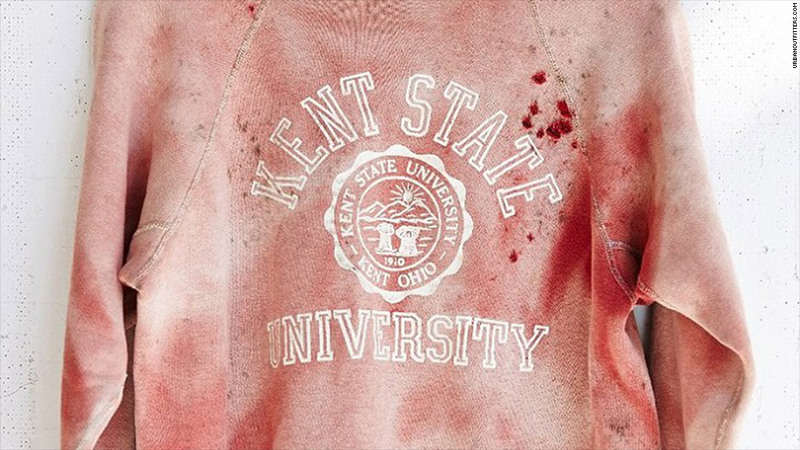 Urban Outfitters has removed the Kent State sweatshirt from its website. After coming under fire on social media, Urban Outfitters has apologized for selling a "vintage" Kent State sweatshirt that many found highly offensive. The $129 sweatshirt has been removed from Urban Outfitters (URBN)' website. But images of the sweatshirt, which has red spots on it that critics say resemble blood stains, have been widely circulated online. The edgy youth store issued a statement saying "it was never our intention to allude to the tragic events that took place at Kent State in 1970." On May 4, 1970, four students were killed and nine others were injured at Kent State University in Ohio after National Guard soldiers opened fire on protesters demonstrating against the Vietnam War. Kent State University issued a statement denouncing Urban Outfitters for "using our pain for their publicity and profit." "This item is beyond poor taste and trivializes a loss of life that still hurts the Kent State community today," the statement reads. The sweatshirt was panned on Twitter (TWTR)as "tasteless," "tacky" and "awful." The "one-of-a-kind" sweatshirt was sold as part of Urban Outfitters' "sun-faded vintage collection" and was not altered in any way, according to the statement. There is no blood on the garment and Urban Outfitters said the red stains are due to "discoloration," while holes in the sweatshirt are due to "natural wear and fray." Now, the sweatshirt is for sale on eBay (EBAY). The seller is asking $2,500 for the "infamous one of a kind Kent State Sweater." The starting bid was $550 for the sweater, which the seller says is "perfect for Halloween or whatever your deal is." The seller promised to donate half of the proceeds to The Southern Poverty Law Center. This is not the first time Urban Outfitters, which caters to young consumers who want to seem "hip," has offended the wider public. Urban Outfitters (URBN) has previously come under fire for selling woman's T-Shirts with "Eat Less" and "Depression" printed on it. The Philadelphia-based retailer has also been criticized for a shirt that evoked the stars that Jews were forced to wear during the Holocaust.